If you're a regular reader, you know that I often tend toward the exotic or indulgent in my recipes. But at heart, I'm a steak and mashed potatoes kind of girl. I had an organic, grass fed, La Cense Beef ribeye steak that was just begging to be cooked, and today was as good a day as any to treat myself to a juicy steak. I used French chef Alain Ducasse's method of basting the meat with a generous amount of butter and cloves of fresh garlic. The beef is served in style with a sauce chasseur (mushroom wine sauce), as if I were eating at Alain Ducasse's restaurant. It's a pretty simple meal, and since the meat is of such high quality, why mess with the flavors too much? What with diaper changing, baths for my baby daughter and a little work out in between I've been exhausted, so I thought this delicious steak was well-deserved. Don't you agree? Now if I could only get all the vegetarians in our household (namely my husband Lulu), to give it a try. They don't know what they're missing out on! And don't forget to enter our La Cense Beef Giveaway. Entering is easy — just leave your email address below! I’ll be choosing one winner at random. You have one more day (until this Friday, January 27th at 12pm PT) to enter. Good luck everyone! Plus, La Cense is offering a special deal to Pham Fatale readers. You can get $20 off 8 10-ounce Ribeye Steaks, plus 1 lb of free meatballs, all with free shipping ($157.48)! 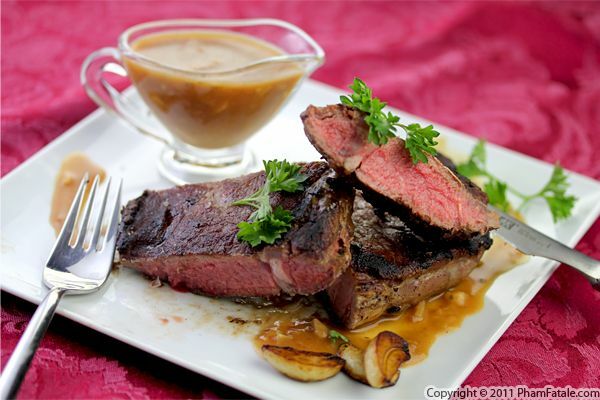 If that's too much meat for you, La Cense is also offering $10 off 4 10-ounce Ribeye Steaks ($71.24). La Cense Beef is 100% grass fed, with no hormones or antibiotics.